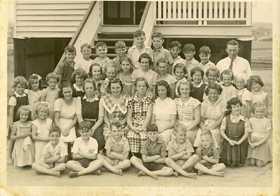 Do you have ancestry who grew up in Queensland? These indexes contain many of the original sources which provide wonderful additional information on the family, including: age at admission, birth date, parents names and occupation, religion, address. Sources from which the names are drawn are diverse, and include: actual school admission registers, school histories covering a significant anniversary in the life of a school, and local histories which may not focus on the school but include a pupil list as part of their story. Schools are a source we cannot afford to overlook! This database indexes 230,757 names from approximately 331 Queensland primary schools. Dates range from 1864 to 1993 with a 30 year closure, as recommended by Education Queensland, when names were extracted directly from Admission Registers. Schools range in size from larger cosmopolitan schools with admissions in the thousands, to small rural single-teacher schools with a total enrolment of hundreds. Some of the schools have long ceased to exist, while others are still functioning. The list of schools included in Part 1 is available here. This database indexes 319,511 names drawn from over 200 Queensland schools. Dates range from 1865 to 1993 with a 30 year closure, as recommended by Education Queensland, when names were extracted directly from Admission Registers. Schools range in size from large city ones with admissions in the thousands to small country one-teacher schools with a total enrolment of hundreds. Some schools have long ceased to exist; others are still functioning. The list of schools included in Part 2 is available here. This database indexes 341,878 names drawn from over 200 Queensland schools. Dates range from 1870 to 1993 with a 30 year closure, as recommended by Education Queensland, when names were extracted directly from Admission Registers. Schools range in size from large city ones with admissions in the thousands to small country one-teacher schools with a total enrolment of hundreds. Some schools have long ceased to exist; others are still functioning. The list of schools included in Part 3 is available here. This database indexes 393,490 names drawn from 331 Queensland schools. Dates range from 1870 to 1993 with a 30 year closure, as recommended by Education Queensland, when names were extracted directly from Admission Registers. Schools range from large city ones with admissions in the thousands to country one-teacher schools with a total enrolment of hundreds. Some schools have long ceased to exist; others are still functioning. The list of schools included in Part 4 is available here. Surname: Pupils name - spelling may differ from known ones - check all variants. A ? indicates the surname was not given or cannot be deciphered. Given name: As taken from the source document, usually full given name, sometimes first name followed by initial, sometimes initials only. A ? means not given or cannot be deciphered. School Name: The name of the school at which the pupil was enrolled. Date: Date of admission is sometimes but not always supplied. Year: Year of admission, depending on the source, is usually given; sometimes when a register is missing, only a time period (for example, 1900-1927) is given. Source Document: The document indexed - often this document will contain additional information which has not been indexed. Reference: This field gives an identifier to allow location of the entry in the source document - the page number (or admission number if given) if the source document is a published book, an admission number, or left blank (the year is often enough to locate the item) if the source document is an admission register.